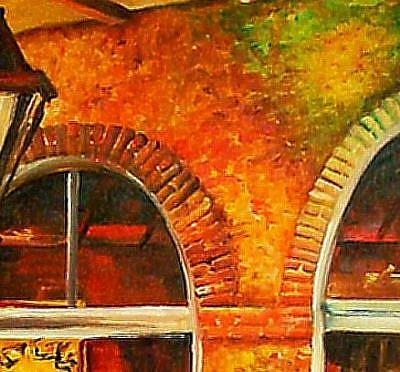 This very tall original oil painting offers a glimpse into the recesses of a French Quarter cafe, where centuries old walls cast their mysterious glow. 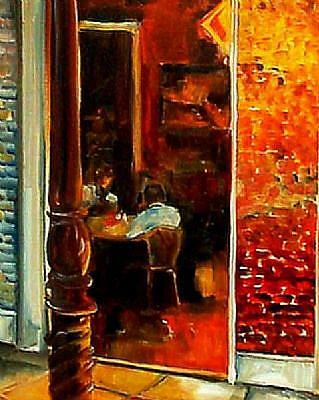 It is painted in Diane's modern impressionist style with free flowing brush strokes, and is sealed with a semi-gloss varnish. It may be hung unframed. (The edges of the 1 1/2" deep canvas are also painted, and a picture wire kit is included.) Diane's New Orleans scenes are in print, and this is an opportunity to own an original. A certificate of authenticity will be enclosed.